In order to justly estimate the life, character, and genius of a man it is necessary to possess some knowledge of the environments and heredity which generated him. Any study of Voltaire which ignores these influences will fail not only in doing him justice, but in comprehending his unique and exceptional place in history. The most careful examination of these, together with the voluminous bibliography relating to Voltaire provided by French, German, and English literature, still will leave him something of an enigma. Louis XIV. wore all the outward guise of regal office, in his bearing, politeness, address, magnificence, and high-heeled dignity, but he was sensual, ferocious, ignorant, profligate, and superstitious. His greatness was fictitious, his splendor superficial, and his character false. The king was the state, but his mistresses governed. A court thus constituted led the fashions and formed the manners of the people. It stamped the age with that type of character which belongs to the adventurer and devotee. The splendors of the court were maintained at the expense of the people. The glory of Versailles rose above the darkness of the nation. The voluptuous and luxurious pleasures of the nobility were the measure of the poverty and suffering of the people. The aristocracy enjoyed life as if it were a prolonged comedy, while the nation was moving toward the enactment of its greatest tragedy. Religion was reduced to superstition, theology was divorced from ethics, ritual performances were substituted for moral obligations, and zeal for God manifested by cruelty to man--conditions which are invariably concomitant in religious history. The Mephistopheles evoked by the German Reformation was abroad, and had announced himself to others besides Dr. Faustus, saying, "I am the Spirit who denies." Freedom of thought involves a liberty to think wrongly as well as rightly. Technical learning, in possession of the Jesuits, might content a religious devotee; but philosophy and the new science opened paths which led away from traditions and authoritative decretals; paths which neither priest nor king could close, for they followed the stars in their courses. The waymarks had been blazed by the genius of Galileo and Copernicus. Those who dared to venture into this new territory found institutions and systems of theology arrayed against them, armed with the power of present persecution, more to be feared than threats of future damnation. Public life was venal, the Church simoniacal, and society licentious. In such an age Voltaire was born. The family of Arouet was ancient and respectable, representing the middle class of society. 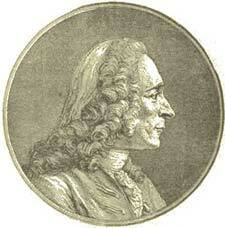 Voltaire's grandfather settled in early life in Paris, and retired on a comfortable fortune made by selling cloth. His father, Francois Arouet, was a successful notary of Paris, an honorable profession, which included all that is now done among us by lawyers, brokers, life-insurers, and administrators of estates. Many of the characteristics which we discover in his father, and, indeed, in all the Arouets, survive in Voltaire. They are vivacity, thrift, irritability, and withal a pleasing and generous disposition. 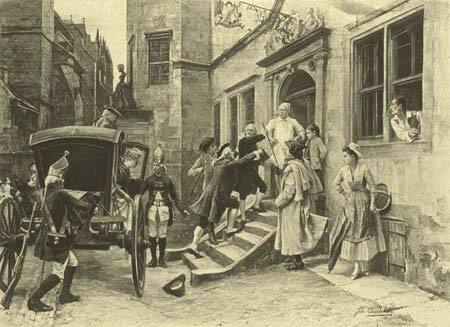 The Arrest of Voltaire and his Niece by Frederick's Order. Francois Marie Arouet was the youngest child of a too prolific mother. He was born November 21, 1694, a weakly, feeble babe whose life was despaired of during the first year. The child was abandoned to the care of a nurse, his mother being an invalid. She died when he reached the age of seven. By the time the infant was two years old he began to thrive, and grew into an active, healthy child. Not robust, he was, nevertheless, wiry, and endowed with nervous energy. His earliest instruction was from the Abbe de Chateauneuf, who taught him belles lettres and deism. At a very early age the little lad exhibited a precocious talent for versification. When ten years old he was sent to the College Louis-le-Grand. Here he remained until he was seventeen, receiving an education which, though always depreciated by him, provided the basis of a wide and varied knowledge. The Jesuits, who were the instructors at this college, retained the methods of the schools of the Renaissance, in which plays in Latin and French were enacted by the scholars. This may explain his life-long devotion to the drama. His remarkable poetic talent led to an introduction, when he was but eleven years old, to Ninon de l'Enclos, who, in her nineteenth year, was the leader of a brilliant coterie of society. This unaccountable and marvellous woman was so pleased with the lad that she left him a legacy of two thousand livres "to buy books with." When his college days were ended his troubles began. His father had determined to make him a notary. The youth wanted to follow literature, which the father regarded as equal to no profession at all. The father triumphed in so far as securing the young man's consent to begin the study of law. He began but never proceeded, and gave himself to everything but the pursuit of legal lore. The Abbe de Chateauneuf, the godfather of Voltaire, died before the boy's college days were over, but before his death he introduced his pupil to the celebrated society of the Epicureans of the Temple. Here the youth gathered the vast mass of historical gossip which served him so well in later years. His father was disgusted with his son's pursuits, and, alarmed at his association with princes and philosophers, he sent him away to the ancient Norman city of Caen. This did not effect a cure. The notary sent word to his son that if he would settle down and finish his studies he would purchase for him a commission as counsellor to the Parliament of Paris. "Tell my father," he answered, "that I do not desire any place which can be bought. I shall know how to make one for myself that will cost nothing." Voltaire had a brother, named Armand, who was a Jansenist and bigot. Their father commented on his two sons by saying, "I have a pair of fools for sons, one in verse and the other in prose." In the year 1713 the Marquis de Chateauneuf, a brother of the Abbe, appointed Voltaire to the office of page in his diplomatic corps. The marquis was Ambassador to The Hague. Here the young man fell desperately in love with Olympe Dunoyer, a young woman about twenty-one years of age, and the daughter of a woman who had separated from her husband, and supported herself by writing disreputable scandal and gossip. This love affair was violently opposed by the mother and resulted in the young man's being sent back to Paris. For a brief time he gladdened the heart of his father by resuming the study of law, but soon manifested his peculiar facility for getting into trouble. Defeated in securing an award from the French Academy for a poem, he turned his wit against the successful candidate, and also the poet La Motte, who had decided the competition. A large part of his attack was harmless fun, but a short and very savage satire aimed at La Motte was dangerous to its author, so his father was glad of the opportunity to send his scapegrace to the Chateau de St. Ange, in company with De Camartin, nephew of the Marquis de Saint Ange. The old marquis was a just and brilliant magistrate, a man familiar with the history of France, and who knew the genealogies of the French court, and all the rare anecdotes of the period included by the reigns of Henry IV. and Louis XIV. That Voltaire improved these days at St. Ange is undoubted. He returned to Paris at the time of the death of the king. This time he was admitted to the famous "court of Sceaux," over which reigned the brilliant Duchesse du Maine. It is charged that he assisted the duchess in composing lampoons on the Duke of Orleans, then Prince Regent. Accused of writing two libels, he was arrested, May 16, 1717, and sent to the Bastile, in which prison he spent eleven months. While here he gave himself to serious literary labor. At this time he changed his name, and was henceforth known as Arouet de Voltaire. The origin of the new name is one of the disputed problems of biography. Released from the Bastile, he was, according to custom, ordered into exile, being permitted to go to a place owned by his father in the village of Chatenay. In October, 1718, he was permitted formally to return to Paris. In the spring of the following year he was suspected of having written the "Philippiques," and was banished informally from Paris. Most of this period he spent with Marshal Villars, and gathered more of those reminiscences, which he used with so much skill later in his career, besides making harmless love to the duchess, the wife of his host. In 1721 his father died, leaving him an income of about four thousand livres a year, and this was further increased by a pension of two thousand livres a year from the Regent in recognition of his ability as a dramatic writer. Several years were spent in Paris in literary labors and in acquiring powerful friends and more powerful enemies; among the latter was the Chevalier de Rohan, who insulted Voltaire on different occasions, which led to sharp replies from the caustic youth. The chevalier hired some roughs to give him a caning. Voltaire could get no one to take his part, so he challenged the chevalier to a duel. The challenge was accepted, but on the morning of the day appointed for the meeting the Government interfered by kindly arresting Voltaire and putting him again in the Bastile. After fifteen days of imprisonment he was released on condition that he would go to England. The chief turnkey of the Bastile was instructed to go as far as Calais with the troublesome prisoner, in order to be sure that he was forwarded to his destination. Nothing in Voltaire's history did more to form his career than his visit to England. He made a good deal of money there, and it is said, laid the foundations of his fortune. He formed acquaintances among the foremost literary men of that nation, such as the Walpoles, Bubb Doddington, Bolingbroke, Congreve, Sir Everard Falkener, and the poet Pope. The effect of these associations in the literary career of Voltaire is marked. They deepened and broadened his mind, and reduced the flippancy of method, which is the bane of French literature, to its minimum. He suffered an exile of three years, a long term for the offence he had committed. In 1729 he was permitted to return to Paris. That year, by a lottery speculation, in which he was a sure winner, he secured enough money, when added to what he already possessed, to render him independent of all patronage. From this time on he never knew the want of money, nor permitted an opportunity to pass by which he could increase his riches. The next few years were mainly devoted to the production of poems, plays, and English letters. During these years his pen continually brought him into difficulty. Some of his productions he denied. At last, in 1734, when a pirated edition of his English letters appeared, containing also a criticism upon the fanaticism of the saintly Pascal, full of heresy, good sense, and keen satire, the fury of the storm broke upon him again. A warrant was immediately issued for his arrest; the officer charged with the duty of capturing him found that Voltaire had left the Chateau at Monjeau, where he had been in attendance at the wedding of the Duke de Richelieu, so the arrest was not made. We now find him at the Chateau of Madame du Chatelet. His relations with this woman will not bear scrutiny. The most charitable construction which can be put upon the fifteen years during which Voltaire lived with her is, that she, like himself, was morally the product of the age. If, however, it is urged against them that there were pure women and honorable men in France at that time, it may be asserted that such were men and women who had not been surrounded from childhood with the influences and social customs in which Voltaire and Madame du Chatelet lived, moved, and had their being. When this woman died Voltaire found himself in a very unsettled condition. During his life at the Chateau de Cirey he had received letters from Prince Frederick of Prussia. Now the prince is king, and he asks Voltaire to be his guest, and find with him a refuge and a home. The "respectable Emily" being dead, Voltaire, after considerable haggling about money matters with Frederick, who behaved generously, at last consented. In the year 1751 the French author reached Berlin. Frederick treated him in a right kingly way. From the very first Voltaire behaved like a marplot, rather than as the guest of a king. Quarrel succeeded quarrel. Most of his embroilments with the king were of less credit to Voltaire than to Frederick. The former was as full of tricks as Puck, and impish in his mischief. Frederick was overbearing and tyrannical. Having a rude sense of justice, being German, he would grant no license to the stinging, envious satires of the jealous, envious Frenchman. They managed to get on with each other for about three years. Voltaire disgusted Frederick by getting into a lawsuit with a Jewish banker named Hirsch about a discreditable speculation in Saxony money. Finally he began a violent controversy with Maupertuis, president of the Berlin Academy. He libelled this boorish but able scholar, who held his office by appointment of Frederick. He lied to the king concerning one of the most cutting satires in literature, which was aimed at the president. He tricked the king in the shabbiest manner. He had succeeded in getting into difficulty with his usual facility. He asked for permission to leave the court of Frederick, pleading business at Paris, and also that his health required him to visit Plombieres, in order to drink of its waters. Frederick gave him leave to go. On the eve of going, in utter disregard of his promise to the king, he fired a parting shot at Maupertuis, in the shape of a supplement to the attack he had already made, then travelled leisurely on his way. Frederick waited until he reached Frankfort; there he was detained by order of the king on the charge of having some verses written by Frederick in his possession. The resident at Frankfort was as stupid and clumsy as a German official can be, and managed the affair in a most rude and indelicate manner. Exasperated at the delay, Voltaire committed the folly of undertaking to steal away. He and his niece were arrested and imprisoned in an inn, where they were subjected to very unpleasant treatment. The action of Frederick was unworthy of a king. Its meanness was intensified by the bungling stupidity of the resident. The people of Frankfort grew indignant, and the burgomaster began to show resentment, for Frankfort was a free city and the King of Prussia had no right to trespass upon its privileges. It was mean in a monarch to strike this foul blow because he had been pricked with a sharp pin. From this time forth Voltaire entered upon a life of complete independence, free from all incumbrances of mistresses, royal patrons, or aristocratic friends. He tried residence in Geneva and Lausanne, but while he found political liberty, he was not accorded by the pious Swiss the social freedom to which he was accustomed in France. Finally he purchased a place at Ferney. His home here became the Mecca to which the literary celebrities of Europe made pilgrimages. At Ferney he established watch-manufacturing, competing with the Swiss; here also he built a church, inscribing upon it "Deo crexit Voltaire." In pure mischievousness he entered upon an indecent controversy with the bishop of the diocese, who was a good though foolish man. He also managed to quarrel right and left with all sorts of people, while slowly and imperceptibly old age crept upon him. Much of the noblest work of his life was done here. It was while at Ferney that he adopted a young girl of noble but poor family, rescuing her from a convent and marrying her to the Marquis de Villete. She contributed to making many of his declining years bright with her presence. His pet name for her was "Belle et Bonne." For some of his work done at Ferney he has won the respect and admiration of mankind. Such were his noble defence of the Calas family, his successful attack upon the outrages committed upon Sirven and his family, securing the liberation of Espinasse from the galleys, the vindication of General Lally, and the brave battle for D'Etalonde and La Barre, together with many other cases in which his powerful pen proved its strength in defence of the weak against the oppression of civil and ecclesiastical tyranny. This part of his career provides the staple material for his eulogists, as it is not without genuine value. With the death of Louis XV., Voltaire evidently expected that he would be invited to return to Paris, but the government did not give him any encouragement. By the beginning of 1778 he had finished a tragedy entitled "Irene," and on February 10th he arrived in Paris after an absence of twenty-eight years. Though not received very cordially by the ministry, he was heartily welcomed by the Academy and all the foreign celebrities at the capital, among them the American minister, Dr. Benjamin Franklin, to whom he said, "If I were only forty years old I would immediately go and settle in your happy country." An hour after Franklin left, the English ambassador called, to whom he made himself equally agreeable. The prolonged excitement of the continuous attention paid him, at last brought on a severe illness. In order to secure the right of burial in consecrated ground he professed conversion. Recovering temporarily, he scoffed at himself, saying, "It is necessary for a man to die in the religion of his fathers. If I lived on the banks of the Ganges I should wish to die with a cow's tail in my hand." Before he died his secretary, Wagniere, entreated him to state precisely his "way of thinking" concerning religion. Voltaire asked for paper and ink and then wrote and signed the following, which is now to be seen in the National Library at Paris: "I die adoring God, loving my friends, not hating my enemies, and detesting superstition. Feb. 28th, 1778. Voltaire." His play "Irene" was first given on March 16th. By the 30th of the month he was able to attend, and that night, in the theatre, received an ovation unequalled in history. Shortly after, his illness returned, in which he lingered until May 30, 1778, dying at the age of eighty-three years and six months. There was difficulty in securing a permit for his burial, and not until 1791 did his body find a resting-place in the Pantheon. As a dramatist he ranks next to Racine and Corneille, but as an epic poet he is a failure. His romances are probably the best evidences of his versatile and wonderful powers. They embody all the hate and really noble anger of his soul against the evils which were crushing the life of the French people. Their wit never fails, and they flash and sparkle with his matchless brilliancy of satire. As a writer of history he has never been regarded as possessing very great merit, for two reasons: First, he was totally lacking in any grasp of the philosophy of history; second, he was not careful as to accuracy in stating facts. His philosophical works are largely covert attacks upon the religious and ecclesiastical systems of his day. These are interesting reading matter if one does not regard the absurdity of any permanent claims to physics or metaphysics which they contain. His criticisms and miscellaneous works reveal all the characteristics of his other writings--pungent, witty, sharp; indicating, however, more of the skill of the journalist than of the great author. He has not left a single line which embodies a great thought. He was a man of supernatural brilliancy rather than of great genius. Had his work been less witty and bright, he would be charged with superficiality; that which saves him from the accusation is the marvellous display of mental acuteness and a perfect mastery of the French language. The thought in his productions is as ephemeral as that in a morning newspaper; but his composition will serve to this day as a model of the possibilities of the French tongue. In this respect he is unrivalled. Popular conceptions of Voltaire are in some respects erroneous. He is regarded as an arch infidel and bitter foe of religion. On the contrary, he was always a deist. He never assails "The Sermon on the Mount," nor can one who reads him carefully believe that there would not have been a subtle sympathy between him and the best religious minds of later days. He never mocked men who lived good lives, nor opposed with any bitterness those who were the friends of liberty of conscience.